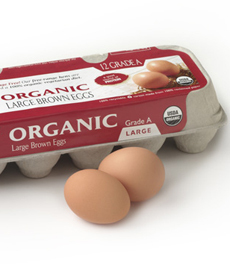 Organic eggs come from chickens that have pesticide-free foods and have not been given antibiotics. They also must be free to roam. Photo courtesy Organic Valley. This is Page 3 of a four-page glossary of egg types and terms. Click on the black links below to visit other pages. What’s the deal with organic eggs? And how about those quail eggs that have become so fashionable? Get the scoop here. Hens are not given hormones, period. So all eggs are hormone-free. These eggs come from hens who have been fed a special diet to increase specific nutrients. These can include lutein, omega 3 fatty acids and vitamin E.
Organic chicken eggs follow the USDA organic certification guidelines, and will have the USDA seal on the carton. Like free-range hens, these hens must have daily outdoor access in an area covered with natural vegetation. However, more stringently, the vegetation cannot have been treated with chemical pesticides. 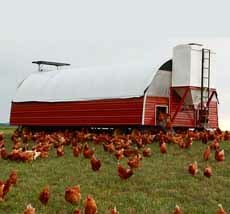 Their feed and bedding (straw) must be wholly organic, i.e., free of chemical pesticides, herbicides or fertilizers. They cannot be given any antibiotics or hormones. Should a hen require antibiotics for medical reasons, it cannot be returned to an organic flock. 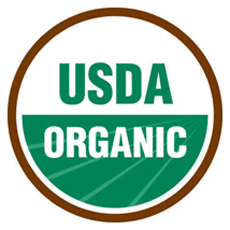 All USDA-certified organic foods carry this seal. Once the eggs are laid, no artificial coloring or vitamins are added. Thus, the yolks can be paler in color. However, the flavor is much more vibrant. Learn more about organic eggs. 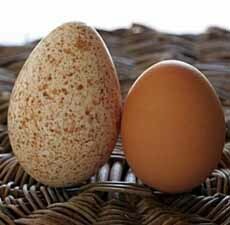 The ostrich egg, along with the emu egg, is the largest egg: twenty times as large as a chicken egg. The ivory-colored shell is very thick, requiring a sharp knife to crack. Ostrich eggs are becoming more widely available, and can be found at Whole Foods Markets. See a photo of an ostrich. This is not a government or other official designation, and it is not monitored. However, it is intended to mean that the hens spend most of their lives outdoors, with frequent changes of pasture area in which to forage. They also have access to a barn should they wish to go inside. A pasture-raised egg means the hens had free range in a pasture, where they could roam at will and peck for grubs and worms. Photo courtesy Stolzfoos Layers. The newest type of egg is the pasteurized shell egg. A regular hen’s egg in the shell is pasteurized without cooking the egg, eliminating the potential danger of egg-borne illness caused by Salmonella bacteria. Dishes that use raw eggs, such as steak tartare and Caesar salad, can be enjoyed without risk; those who enjoy a nibble of cookie dough and brownie batter can do so; and people with illnesses who avoid foods with possible contaminants can enjoy eggs to their hearts’ delight. 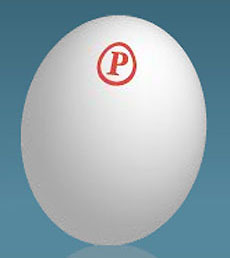 The “P” stamped on the egg signifies that it is pasteurized. An egg pasteurized in the shell. Photo courtesy SafeEggs.com. Quail eggs have a similar flavor to chicken eggs, but their petite size (five quail eggs equal to one large chicken egg) and pretty, speckled shell have made them popular with gourmets. The shells range in color from dark brown to blue or white. 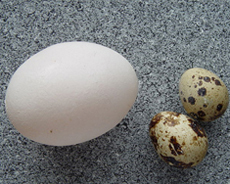 Quail eggs have a mildly gamey flavor and are popular in hors d’oeuvres, tapas and garnishes. The eggs are often hard-cooked and served as an hors d’oeuvre with sea salt, with caviar (cut in half, dab with crème fraîche and top with caviar), with baby greens or other salad treatment; on gourmet pizza; as a soup garnish or other garnish treatment. M. Nolf | Wikipedia Commons. Quail eggs can be fried and served with pancetta and brioche as a gourmet BLT. One of the most famous uses is in sushi, atop sea urchin (uni—see photo). Other suggestions: Pickle them in vinegar tinted with beet juice; when sliced in half the pink exterior and the yellow are visually striking. Or make mini deviled eggs, sure to evoke smiles. The shell of the egg is composed of calcium carbonate. It prevents bacteria and other microbes from entering, which is why you should not use cracked eggs. Shell color in chickens and other animals will vary by species. In chickens, it can range from bright white to brown; shell color is purely aesthetic and has no impact on the flavor, nutrition, or quality of the egg. The reason most of our eggs are white is because the breeds that are the highest producers (i.e., lay the most eggs) lay white eggs. As you can see in the photo at the top of the page, rare heritage breeds of chicken can lay eggs in the most exquisite colors—coral, robin’s egg blue, olive green and lavender. You’d swear they were dyed, but they aren’t. 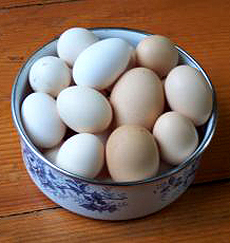 White and brown chicken eggs. Photo by Kaan Tanriover| SXC. If they taste better, it’s because free range chickens that are allowed to scratch and peck for grubs and other insects, supplemented with the finest organic feed, taste a lot better than factory-produced chickens that get no muscle-building exercise and eat cheap feed. Raw eggs in the shell, as opposed to de-shelled whole eggs, whites only or yolks only, which are purchased by commercial enterprises. 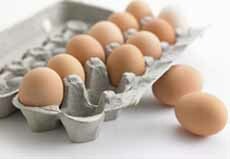 A dozen or half-dozen eggs in the familiar grocery store carton are shell eggs. Shell eggs, what consumers simply call a carton of eggs. Photo courtesy Novinite. Turkeys lay large eggs with a brown shell and a delicate flavor. The reason turkey eggs aren’t generally found for sale is economics: the average turkey produces only 100 to 120 eggs per year, compared to the average egg-laying chicken’s 300 eggs per year. In addition, chickens begin to lay at 19 to 20 weeks of age, but turkeys don’t begin until 32 weeks. Given how much more room is needed to house a turkey (16 to 17 pounds average weight compared to 3.5 pounds for a chicken) and how much more feed is required, it takes more time and more money to produce one-third the eggs. Here’s more about it. A speckled turkey egg next to a brown hen egg. Photo courtesy WFYI.org. The odd egg out on this list, this reptile’s egg has a mild, rich flavor. Its soft shell is buff or speckled. 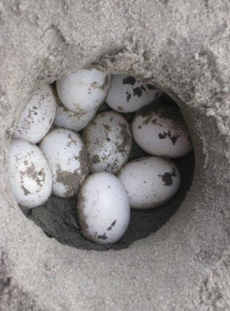 Turtles lay their eggs in the sand on the beach, and birds and other predators are on the hunt for these delicious eggs.